skills to low-level L2 learners. Teaching Effective Academic Presentation Skills to Low-Level English Speakers. 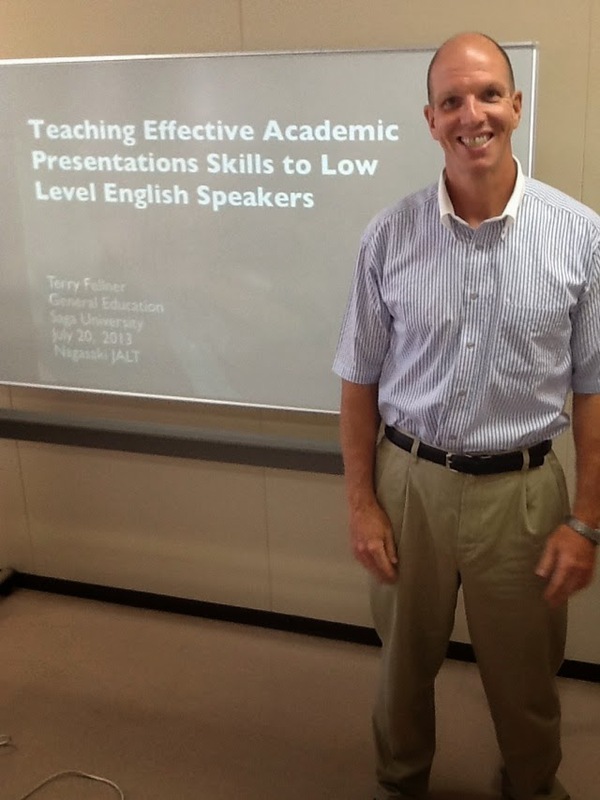 In the second part of our JALT meeting in July, Terry discussed the very successful program he has been teaching for a few years at his university. The theme of the course is "Effective Academic Presentation Skills" and the target is for low-level English speakers. Additionally, the course covers public speaking, organizational skills, autonomy, and has a focus on building self-confidence. This course provides useful skills people might need as teachers, professors, business life, and so on. The course pedagogy is based on constructivism: that knowledge is constructed and not transferred. It is a student-centered course and assessed alternatively - there is no final test but there is a final presentation. As a result of his efforts, some students at his university have won international awards for presenting their research in English at overseas conferences. To that end, the university has now opened up this course as a kind of Faculty Development for the staff. At first, he gets his students to think of a chef. Not everyone can cook, not everyone can present. But using a recipe, it is possible for anyone to make a successful presentation. Practice done in small steps using the scaffolding (one thing builds on the previous) technique. Each presentation must be designed with a beginning, a middle, and an ending. The benefit of presentation is networking. You meet like-minded people who are doing the same or similar research. The following notes are some details of Terry's technique. (It should be noted that in both of Terry's presentations during our meeting, he used his recipe for giving a successful presentation so in essence, we witnessed his model in action during his lecture). Overview sign post phrases - where is the presentation going? Do whats easy for their audience, not what is easiest for you. Graphs, charts, tables - Gave us some good examples and bad examples of slides. Drawing attention to a slide before showing it. Grading: negotiated rubrics for evaluation - students come up with the rubric guided by the teacher. During Terry's lecture, participants had a chance to do some of the steps Terry asks his students to do. In this way, we were given a firsthand example of how the course operates. Given more time, we could have turned this into a full workshop on presentation skills. Overall, the information shared with us was extremely useful. Thanks to Terry for his insightful presentation on giving academic presentations in English.